This article is about the ancient Keyblade. You may be looking for Terra, Ventus, and Aqua's Keychain. "Every Keyblade master is bequeathed a Keyblade of his very own. With the passing of time, as you can imagine, more and more Keyblades were forged to be handed down. But of all the Keyblades in existence, Master Xehanort's is the most ancient." —Young Xehanort on his future self's Keyblade. The No Name, also known as Master Xehanort's Keyblade (マスター・ゼアノートのキーブレード, Masutā Zeanōto no Kīburēdo?) and The Gazing Eye (見つめる目, Mitsumeru Me? 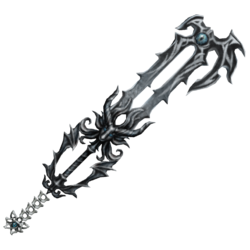 ), is the default form of Luxu's Keyblade that appears in Kingdom Hearts Birth by Sleep, Kingdom Hearts 3D: Dream Drop Distance, Kingdom Hearts χ, and Kingdom Hearts III. 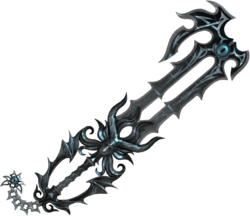 It was handed down over time, becoming the most ancient surviving Keyblade, and eventually came into the possession of Xehanort, who continued to wield it when he became Terra-Xehanort. A digital simulation of the Keyblade is wielded by No Heart, the Mirage Arena simulation of Xehanort. It is also utilized by the replica incarnation of Terra-Xehanort. 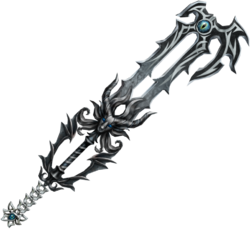 The Keyblade was given to Luxu by the Master of Masters when he received his assignment. The Master had placed his own Gazing Eye within the blade, granting him the knowledge of anything the eye would observe throughout the ages. Luxu initially misunderstood the Master's explanation as the Keyblade being named the "Gazing Eye", but when the Master clarified that the Keyblade had "no name", Luxu playfully named it accordingly. In order to spread its purview and write the Book of Prophecies, he assigned Luxu and the Keyblade the role of leaving town with a mysterious chest, becoming a neutral observer to the events that would soon rock Daybreak Town, and passing down the Keyblade to his own apprentices so that it would survive through the ages. When Foreteller Ava tracks Luxu down and accuses him of being the traitor sowing discord between the Unions, he brandishes the Keyblade at her. Per Luxu's assignment, the Keyblade was passed down from master to apprentice, Destiny with Luxu transferring his heart from vessel to vessel to keep watch over the Keyblade. Secret Reports It was present in Scala ad Caelum when Eraqus and Xehanort played chess against each other. Kingdom Hearts III Xehanort eventually inherited the No Name. Master Xehanort does not often draw his Keyblade, but when he needs to engage in battle or use the Keyblade's powers, he uses this Keychain to do so. In order to prevent Riku from rescuing Sora, Master Xehanort possesses his younger self and wields his Keyblade with a different Keychain. Once Master Xehanort has completely revived, he wields his Keyblade personally with its traditional Keychain, and attempts to place a fragment of his heart inside Sora's comatose body. Master Xehanort uses the No Name during the final battle to fend off Sora and Riku from interfering with his ascent to Kingdom Hearts and forming the χ-blade. Terra-Xehanort also wields the No Name, first at the Graveyard's entrance in order to confront the Guardians, and later within the labyrinth against Sora, Ventus and Aqua, fight in which he teams up with Vanitas. Each clash of the seven guardians of light with the thirteen seekers of darkness creates a replica of the No Name around Master Xehanort's high spot over the labyrinth, of which thirteen are needed in order to forge the χ-blade. By killing Kairi and provoking Sora's rage, he causes a last clash between Sora and himself, thereby creating a thirteenth No Name and turning his own into the χ-blade. 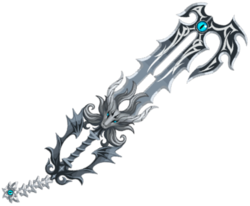 Later, he summons this Keyblade within Scala ad Caelum upon assuming his armored form. Xehanort discards it in favor of the χ-blade for his final fight against Sora. After his defeat, Xigbar, Luxu's vessel, regains ownership of it, wielding it while he called the foretellers to his location in the Keyblade Graveyard. The No Name has a dark black handle with a raised spiral carved around it. Its pommel and guard resemble black, demonic wings. The base of the blade is an etching of a goat,[please confirm] and the shaft is formed from two black, barbed blades, etched with a white icon resembling a bramble of thorns. The teeth are formed in the shape of a demonic wing, and are set with the Master's Gazing Eye. Unlike the Keyblades of the Master of Masters' other apprentices, it lacks Terra's Mark. The Keychain is made of small, grey links, and the token is an entangled, grey talisman with an additional Gazing Eye. The Keychain can take the form of a core for an impenetrable barrier, a claw-like weapon, a greave, a pair of wings that allow flight, or an orb of light. Master Xehanort wields the No Name against Terra, Aqua, and Ventus. No Name in Keyblade Glider form. More alternate forms of No Name. No Name in Scala ad Caelum. ↑ Kingdom Hearts χ Back Cover, Masters of Masters: "Anyway, about your role. You need to pass down that Keyblade to your apprentice, and then him to his, so that my eye can see the future." ↑ Kingdom Hearts Birth by Sleep, Keyblade Graveyard: "Xehanort flashed a crooked smile as he changed his Keyblade into an orb of light which raced into the sky, parting the thick clouds above and revealing Kingdom Hearts." ↑ Kingdom Hearts Birth by Sleep, Final Episode: "In a desperate move to rid himself of Terra once and for all, Xehanort turned his own Keyblade on himself, and began to sink into the pool of darkness that spilled forth." ↑ Kingdom Hearts 0.2 Birth by Sleep -A fragmentary passage-, Story menu: "His hands rest upon the hilt of a Keyblade decorated with the emblem of a goat."